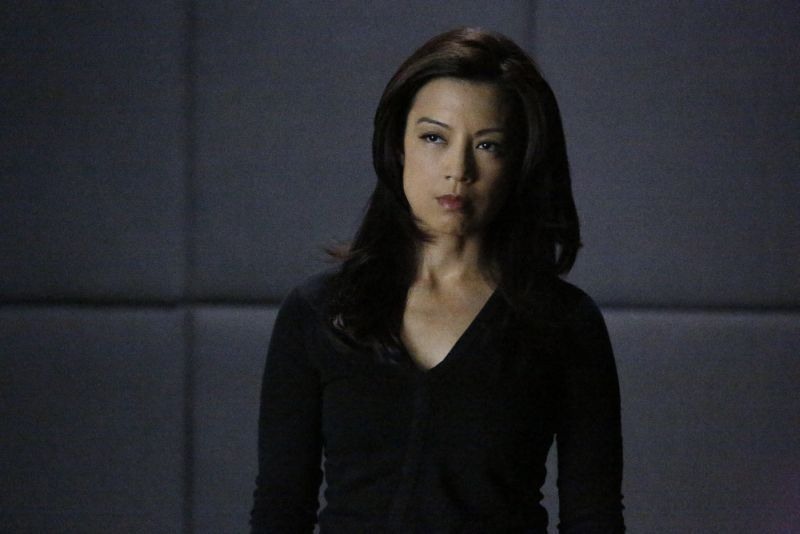 This week on Agents of SHIELD we got some new revelations, major confrontations, and even a possible death, all set up by last week’s “step forward” episode. This episode had a bit of everything, from Inhumans and the ATCU to the reappearance of Lash, to Hunter and May’s quest to stop Ward, to Simmons’ recovery and secret mission. We also have a couple of new mysteries to keep us guessing in the coming weeks! SHIELD is moving along at a pretty quick pace this season, but I think we’re still a little in the dark as to where the season is ultimately heading. But let’s see what we can discover in this week’s SHIELD, “Devils You Know,” written by Paul Zbyszewski and directed by Ron Underwood. There was no way this week’s Agents of SHIELD episode could live up to last week’s emotional, surprising, and intense level. Rather than try to top it, the writers this week wisely gave us one of those “Everyone take one step forward” episodes, in which almost every storyline established thus far this season saw some advancement. In addition to dealing with the fallout from last week’s dramatic events, we saw more of Hunter and May’s quest to hunt down Ward, we caught up with Lincoln, now on the run, Coulson and his team had another run-in with the ATCU, all with a few twists, surprises, and revelations along the way. So let’s dive in to “A Wanted (Inhu)man”, written by Monica Owusu-Breen and directed by Garry A. Brown. It’s great when a TV show can surprise you. It’s even better when a show can surprise you with the very plot development you knew was inevitable, simply by the way the story was told and the timing of events. Agents of SHIELD pulled off just such a surprise this week by giving us something I knew would happen eventually but so soon in week two. Last week we got an early glimpse at some of the ongoing storylines for season three with the introduction of Lash, the ATCU, and Daisy’s search for Inhumans. 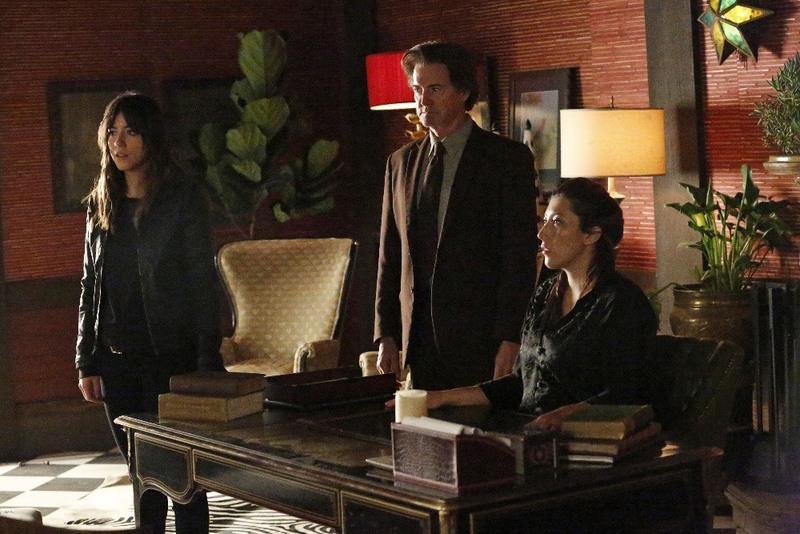 This week brought back May and Ward, missing from the previous episode, as well as a guest star from season one, all while solving some mysteries only to leave more behind. Throw some major emotions into the mix and I couldn’t be more excited about the direction season 3 is headed. So let’s jump into “Purpose in the Machine”, written by DJ Doyle and directed by Kevin Tancharoen. 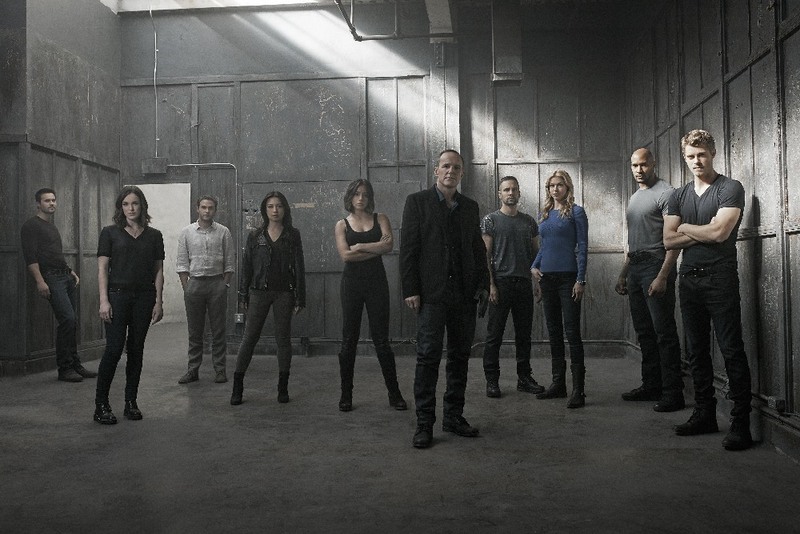 Agents of SHIELD is back for season three! We’ve had a long summer, complete with two Marvel Cinematic Universe films, to speculate on the myriad of cliffhangers from last season’s shocking, action-packed finale. We were left with a resolution of sorts to the confrontation with Daisy’s parents and the Inhumans, but also with the promise of plenty more to come as a reunited SHIELD takes a more active role in the Inhuman situation. Coulson lost a hand, May left on vacation, Bobbi was tortured, Ward is the new head of HYDRA, and the Terrigen crystals were lost into the ocean, there to spread into unsuspecting fish oil bottles around the world. Oh yeah, and Simmons was sucked into the mysterious Kree monolith! Our first episode of the fall didn’t resolve all of these mysteries, but it took a first step along SHIELD’s new course, giving us a look at the direction things are heading, introducing new characters and threats, and setting a strong tone out of the gate. So let’s jump right into season three with “Laws of Nature,” written by Jed Whedon and Maurissa Tancharoen and directed by Vincent Misiano. 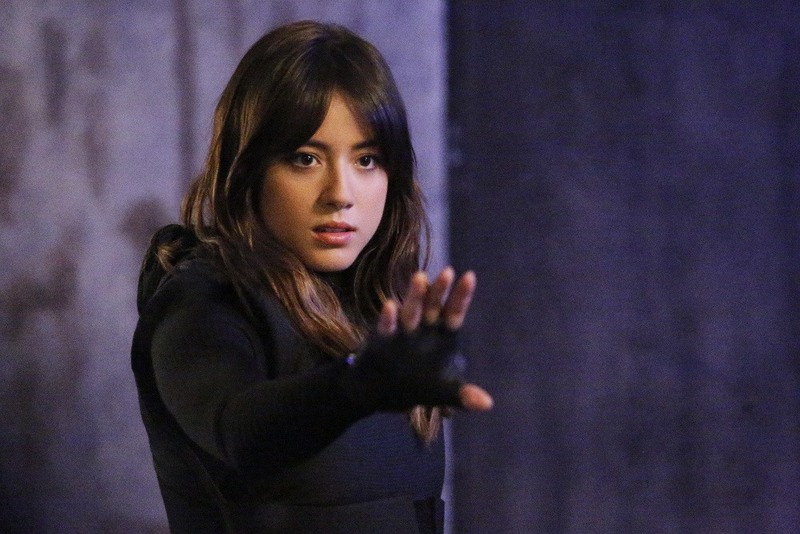 Another season of Agents of SHIELD has come and gone, and this one certainly went out with a bang. Last week’s episode set the stakes for a showdown between SHIELD and the Inhumans, with Skye caught in the crossfire, and the season finale certainly delivered that and more. This episode had it all, from shocks and surprises, to great character moments, to fantastic action and one-liners, to multiple character deaths. It was an intense episode, resolving some of the season’s larger threads while setting things in motion for season three. Let’s jump right into the two-hour season finale, “S.O.S.”, part one written by Jeffrey Bell and directed by Vincent Misiano and part two written by Jed Whedon and Maurissa Tancaroen and directed by Billy Gierhart. The penultimate episode of Agents of SHIELD was preceded by the excitement of Avengers: Age of Ultron and followed this week by the news that both SHIELD and Agent Carter have been renewed for a second season. In between all of that, however, was an episode filled with surprises, setting the stakes for the two-hour season finale on Tuesday. Last week we watched our heroes (plus Ward) launch an attack/rescue mission on HYDRA, reuniting the original team for the first time in what felt like ages. This week showed us some of the aftermath of that mission, as well as the events of Age of Ultron, as the power dynamic at SHIELD was shaken up once again and the conflict with the Inhumans finally came to a head. So let’s take a look at “Scars,” written by Rafe Judkins and Lauren LeFranc and directed by Bobby Roth. Leading up to the premiere of Avengers: Age of Ultron, SHIELD gave us a big episode which tied into current events in the Marvel Cinematic Universe without losing sight of the progression of the show and its characters. 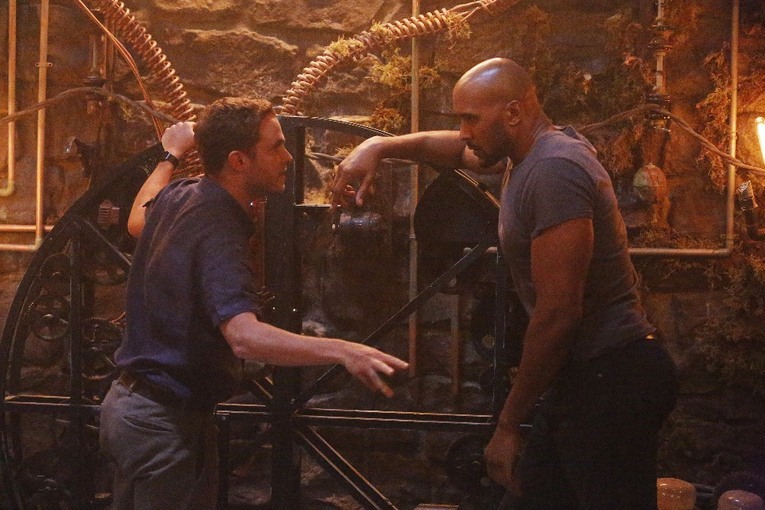 Last week gave us a tense showdown between HYDRA, Coulson’s team, and Cal/Skye/Lincoln as a result of Ward teaming up with Coulson, and left Mike and Lincoln captives of HYDRA. This week brought some big changes, including a reunion of our core six characters, some surprisingly dark turns, some of the best action we’ve seen on the show yet, and more than one death. So let’s jump into “The Dirty Half Dozen,” written by Brent Fletcher and Drew Z. Greenberg and directed by Kevin Tancharoen. I’m back with another two episodes of SHIELD to discuss, finally catching up to the present. The last two I covered saw Coulson’s team deposed and scattered, with some on the run, others stuck with the new regime, and Skye off with the Inhumans learning to understand her powers. Our first episode (look for the second on page two), gave us something we’ve been waiting for since the show’s first episode, the story of how Melinda May became the Cavalry in Bahrain. We also got some further intrigue and revelations from Skye and the Inhumans, as well as the situation becoming much less clear back at SHIELD. So let’s jump into “Melinda,” written by DJ Doyle and directed by Garry A. Brown. It’s been a couple of weeks but I’m back with reactions to two SHIELD episodes. The last episode I covered positioned all of the pieces for a climactic showdown between Coulson’s SHIELD and Gonzales’s “real SHIELD,” and in our first episode dealt with the immediate consequences of that showdown. Allegiances were tested, secrets were revealed, and there were a few twists and turns along the way. We also got some interesting flashbacks, and some seriously great character moments that gave the episode emotional heft. Last season around this time things were torn apart by the events of Captain America: The Winter Soldier, and SHIELD is at it again, once again shaking things up and taking the show in a new direction. So let’s jump right into “One Door Closes,” written by Lauren LeFranc and Rafe Judkins and directed by David Solomon. “One Door Closes” focused almost entirely on Gonzales’s SHIELD’s attack on Coulson’s SHIELD, but it interspersed that storyline with updates from Skye and with flashbacks to how Gonzales’s team came into being. Things started in rough shape, immediately following (or even during) the events of The Winter Soldier. STRIKE commandos loyal to HYDRA have attacked on of SHIELD’s aircraft carriers and have taken hostages. In particular, they have Mack and his team at gunpoint, and they’re searching for the chief engineer of the ship. One man steps up but is shot for being a liar when Mack steps up instead. At that moment a cell phone slides into the room, distracting the HYDRA soldiers long enough for Bobbi to save the day, brutally executing them all. She’s not alone either, as Agent Hartley (remember her?) is at her side, throwing her knife into HYDRA agents in a way that would make Xena: Warrior Princess prowd. Bobbi and Hartley were sent in by Nick Fury to find and rescue Gonzales, and together with Mack they find him lying on the floor in a conference room with a badly injured leg. They set his broken leg, but as the group prepares to get him to safety (with Hartley eager to kill more HYDRA bastards) Bobbi reveals she has another mission. Always one to compartmentalize, Fury tasked Bobbi not only with saving Gonzales but also with sinking the carrier and destroying whatever sensitive information it might contain. Hartley leaves to help rescue more SHIELD soldiers, but Mack and Gonzales stay in order to back him up on her mission. The group heads for the server core, where Bobbi will sink the ship, and along the way they run into Hartley again, who is busy fighting back against HYDRA. Some SHIELD agents have captured a gun on deck and are trying to retake the ship, even if that means fighting their way through fourteen decks of HYDRA. Hartley wants to fight, but Gonzales and Bobbi insist on following Fury’s orders. However, when they get to the server core, and Bobbi says that she has to stay behind to set off the detonation, their opinions start to change. Gonzales insists that they follow orders, but the others point out that Fury is dead and they should reconsider. Gonzales barks out that “This isn’t a democracy,” to which Bobbi replies, “Maybe it should be.” That gives him pause, and eventually the group decides to fight back, and meets the HYDRA agents trying to break down the door with guns blazing. Thus was the beginning of the “real SHIELD,” supposedly based on group decisions and transparency. Back in the present, Bobbi returns to SHIELD, cutting some wires in the Bus and then heads to the server room and inserts a flash drive in one of the computers. She then proceeds to Coulson’s desk and cuts into it to retrieve the Toolbox. Coulson, meanwhile, is finally going to give Mack a chance to work on Lola, a real honor. He was so impressed with Mack’s miniature version of the car that he spent a lot of time studying it, but he noticed something strange that Mack had added. He offers Mack a chance to explain himself and say who he’s working for, assuming that he’s with HYDRA as all of the SHIELD agents around them draw their guns on Mack. Bobbi is confronted by May, who tells her that she hates being wrong. The two fight hard, and just as May gets the upper hand Bobbi sets off an emp, knocking out the lights and allowing her and Mack to escape. Coulson and May regroup, putting the place on manual lockdown and sending Fitz to restart the system. Bobbi has a tablet hidden inside a false fire extinguisher which she uses to call Gonzales to say that she has the toolbox and that Skye is at another location, so they can start their attack. Bobbi then runs into Simmons, who doesn’t know what’s going on. Bobbi looks a little guilty as Simmons talks, and impatiently waits as Simmons hands her things from her bag as she searches for something that will be of help to the team. But when Simmons hands Bobbi a second small device it knocks her out, and Simmons calls Coulson to tell him that she’s captured Bobbi. They handcuff Bobbi to a railing, taking the Toolbox back, while May goes to search Bobbi’s locker, finding a gas mask hidden behind a false back. Fitz finds Bobbi’s mysterious flash drive stuck in one of the servers, but before he can fix anything Mack arrives. Fitz backs away, but Mack insists that he’d never hurt his friend. Gas starts to pour into the Playground, knocking out everyone inside, and Mack lunges at Fitz and shields him just as the wall behind them is blasted apart and the “real SHIELD” invades. 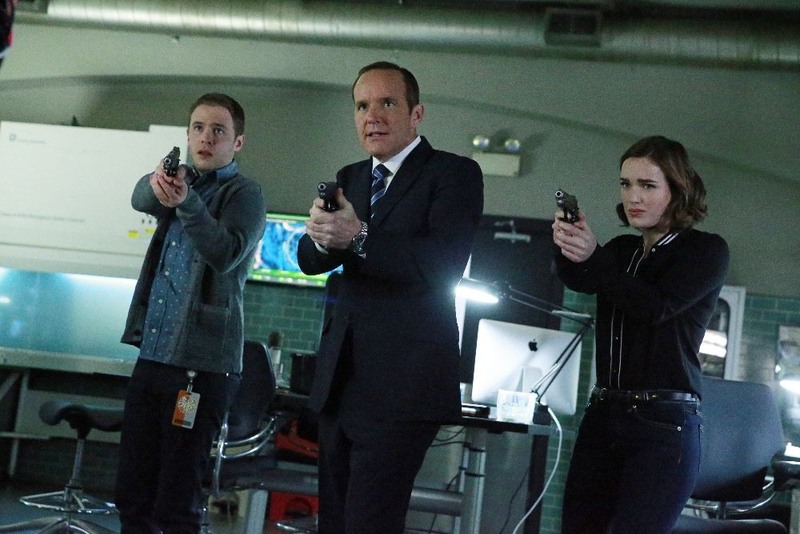 In the aftermath, Coulson and FitzSimmons are captured, while May manages to elude everyone, hiding in the shadows. Simmons is asked to tend to Mack, who was injured in the blast as he protected Fitz. 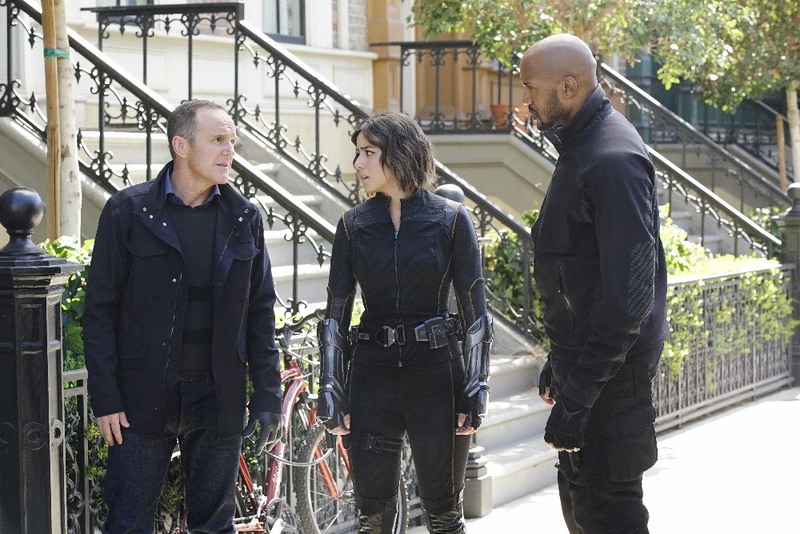 Bobbi and Agent Calderon (who seems to greatly enjoy seeing other people hurt) are sent to bring in Skye, while Coulson is taken in for a talk with Gonzales. Gonzales admires what Coulson has built, but he lays out all of his objections to Coulson being in charge. He reminds Coulson that he was brought back from the dead (“I didn’t ask for that but I’ve come to appreciate it”), had an alien map implanted in his head which he felt compelled to follow to a hidden city which caused Skye and Raina to be transformed and Trip to be killed. Coulson points out that they accomplished their mission, which was to stop Whitehall and destroy the city, but Gonzales doesn’t care. He asks whether Coulson can say for sure that he’s not some kind of alien messenger. He also points out all of the things that Coulson has hid from the team, including what Gonzales suspects is inside the toolbox: a list of hidden things containing power which Gonzales wants to hunt down and destroy. Coulson says that he searched for Gonzales after the fall of SHIELD, assuming he was dead. He points out that Fury chose him to lead the new SHIELD, but Gonzales dismisses that by attacking Fury. He says that Fury thought of himself as king, and made Coulson in the same mold. Coulson gets angry, telling Gonzales that he should have approached Coulson to talk, rather than sending spies into his house, the same way HYDRA did. He questions whether Gonzales believes that Coulson’s team will just join up with him, but Gonzales says he’ll let them make their own decisions. “I already have,” says May, bursting through the door and ICEing Gonzales. May opens a secret panel to reveal a hidden elevator, and shoves Coulson inside, handing him a briefcase and telling him to find Skye. She says she’ll look after FitzSimmons, and before he can object she sends him away, closing the hidden door behind him just as agents swarm the room and she surrenders. As for Skye, she had a different experience in this episode. She started things out by videochating with Simmons, lamenting playing solitaire and eating Simmons’ gross gluten-free biscuits. She thanks Coulson for the snack pack he sent, but doesn’t like being cooped up alone. 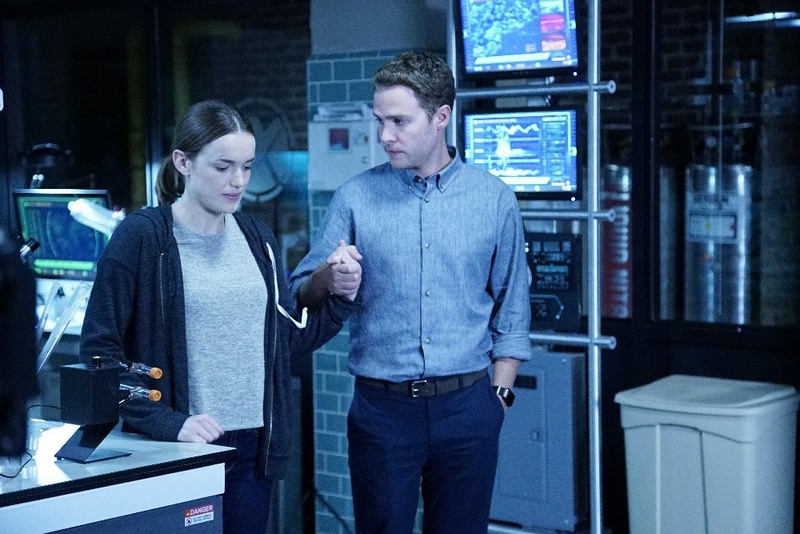 Simmons insists that she just wants Skye to be safe, but they’re interrupted by Fitz grumpily asking how Simmons’ “science experiment” is going, putting an end to their chat. Later she takes Simmons’ advice and tries on the gloves, which glow when she puts them on. She starts to panic a bit and feel a little woozy, so she tries to call the base but can’t make a connection. She checks the network cable connection, tracing it to the wall which gives a hollow sound when she knocks on it. She breaks a piece of the wood paneling off to reveal hidden walls underneath that resemble the Cage on the Bus. Only in this reinforced wall is the imprint of a Hulk-sized fist. She hears an odd sound outside and starts to get really worried, conjuring up images of horror movies. There’s a knock on the door, and she answers it to reveal Gordon, the Inhuman teleporter with no eyes, who asks if he can come in. She lets him inside and he takes a seat on the uncomfortable couch, introducing himself and trying to act friendly. He tells her that he knows she’s afraid, but that he’s a friend who is like her, only he had years to prepare for the transformation. He tries to crack a joke by telling her that he wishes she wouldn’t stare at him, but it falls flat. He tells her about his mentor (her mother, Jiaying), whose first act was to embrace him. He asks Skye what her new power feels like, and she tells him it’s like a thousand bees trapped inside, and she can feel it all the time. She worries she’ll destroy everything, but he tells her that her ability to tap into the natural vibrations of the world could become magnificent. He asks why she wears the gloves that restrain her powers, and she says they’re for protection, but he wonders whom they are protecting. “Most gifts come with a price,” he says, but says that they can teach her to manage her powers so that she can “be who you were meant to be.” He offers to take her to a safe place where she can be with others like them, but he’ll only take her if she wants to come. He leaves, telling her that he’ll know if she wants him. She considers what he said, and decides to take off her gloves to experiment a bit. She uses her powers to manipulate water running from a tap into a spiral, and for the first time she smiles to herself as she sees her ability as something good and beautiful rather than something of which to be afraid. She isn’t given long to enjoy her powers, however, as she gets a phone call from May who tells her to get out. May instructs her that there’s a panel in one corner of the compound which she can use to deactivate the laser fence and escape. Skye asks who is coming for her, and May tells her it’s SHIELD, and when the power in the cabin goes out May yells for Skye to run now. Bobbi leads a team to capture Skye, reminding them that Skye is a SHIELD agent and that they’re only to use ICERs on her. They set out through the woods after Skye, but Agent Calderon decides he’d rather use real bullets. 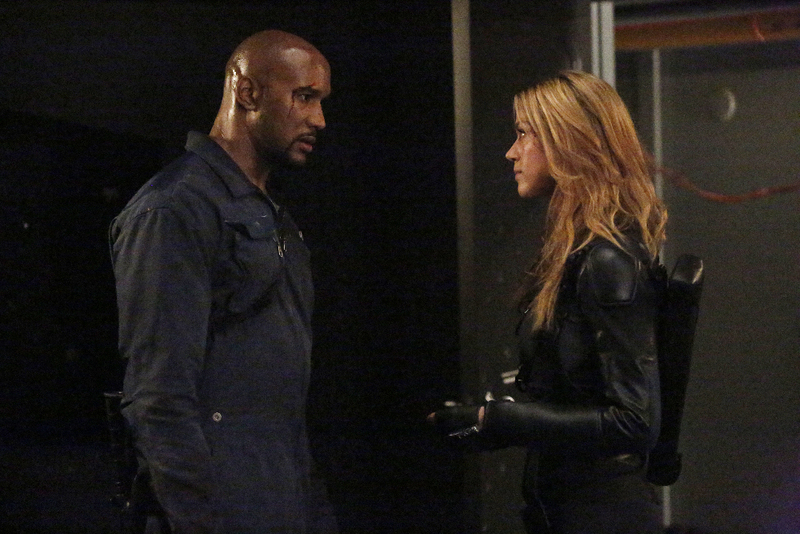 Skye beats up one of the SHIELD agents, but is cornered by Bobbi and Calderon. Bobbi tries to reason with her, but Calderon decides to end things right there, firing at Skye. She holds her hands up in front of her and uses her powers to deflect the bullet, before sending a shockwave towards Bobbi and Calderon, shattering a tree between them and sending the pair backwards in a shower of splinters. Calderon is hit in the chest by a chunk of wood, while Bobbi is just knocked to the ground. Skye calls for help from Gordon, who appears at her side asking if she’d like to go “home”. Before Bobbi can do any more, Gordon and Skye have vanished. The episode’s final scene was also one of my favorites. We see Coulson sitting at a bar down on the beach, ordering a fruity drink that comes with an excessive amount of tiny umbrellas. The bartender makes a comment that he expects Coulson’s wife got the house in the divorce, when who should walk up but Hunter. Hunter orders a drink of his own, telling the bartender to make sure to put some tiny umbrellas in it, and then says to Coulson, “Sorry I’m late. An evacuation pod will wash up when and where it wants to.” He remembers something and grabs a cocktail napkin, signs his name on it, and slides it over to Coulson. He explains that Coulson offered him a job a while back, and he’s offering up the signed cocktail napkin as his contract. “What’s the plan, boss,” he asks with a smile. The most impressive part of last season was the way SHIELD was willing to completely shake things up and change the very nature of the show, taking our heroes from being part of a huge organization to being on the run from that same organization, now overrun with HYDRA. Once again the show has ripped apart the foundation of our heroes, sending them on the run again but with even less resources, and now all split up as well. As much as I don’t like to see these characters I love in danger, because I don’t want anything to happen to them, it’s thrilling to watch our heroes have to fight and scrap and improvise, and it really lets them show off their talents (both as characters and as actors). I can’t wait to see what the rest of the season has in store, and in what direction things will go. And at this point, if there’s a season three, we have to expect a big shakeup around episode 14-16. I’m very intrigued by Gonzales, and not just because he’s portrayed by the fantastic Edward James Olmos. From the way the character is performed, it seems like he doesn’t actually believe in transparency and democracy when it comes to running SHIELD, but he’s using it as a smokescreen in order to act on his desire to wipe out what he sees as threats. In particular, he’s made several references to the theory that Coulson is stockpiling individuals with powers, though he hasn’t given voice to what use he thinks Coulson might have for them. Maybe he’s afraid that Coulson is planning some sort of takeover, or maybe he thinks the line between Coulson’s tactics and HYDRA’s isn’t as clear as things appear. He also threw out the theory that the toolbox contains some sort of index of powerful items that he intends to track down and destroy. Is he really out to destroy them in order to prevent their use, or is he after them in order to grow his own power. It’s tough when an actor is so familiar from another show (in this case Battlestar Galactica) that there’s a bit of bleeding through from one show to the next. I feel inclined to trust Olmos, but what we’ve seen from Gonzales raises some concerns. As I said above, one of my favorite moments of the night was Hunter’s appearance in the final scene. I’ve been kind of lukewarm on Hunter thus far. He’s entertaining and provides great snarky comments, but I hadn’t really accepted him as a member of the team until that moment. And it was more than just the fact that he’s officially “signed on” with Coulson’s team. At a moment when Coulson was at his lowest and everything he’s worked to build has been pulled apart, and he doesn’t have a friend in the world, there’s Hunter, just sauntering up to sit next to him at the bar, have a drink, and sign up. I love that despite never really being a part of the team, he’s never questioned that Coulson is worth following, despite his faults. Where Bobbi and Mack have been revealed to be double agents with conflicted loyalties, Hunter has been remarkably straight forward, despite Gonzales’s rhetoric. And now that Bobbi seems to be struggling with what’s right and who to really believe, it’s a great change to have Hunter so sure. The other two moments that really got to me in this episode revolved around FitzSimmons. The most obvious was Simmons taking out Bobbi so easily. Our little scientist has come a long way from someone unable to lie last season to being able to deceive Bobbi so smoothly and to pass off her little plan as simple singlemindedness. I would totally have taken whatever Simmons handed to me and would have ended up unconscious too. It felt completely in character yet also surprising, and a reminder of how far she’s come and how much she’s grown and has lived through. She’s confident and cool under pressure, yet without losing herself. The second moment totally made me tear up. It was after the group was first captured by Gonzales’s soldiers. Fitz and Simmons were sitting side by side on the floor in the lab, and despite everything they’ve been through recently and all of their disagreements, Simmons reached over to take Fitz’s hand. But more than that, he returned the gesture, covering her hand with his, showing that despite their differences and issues they still care for each other and still support each other.